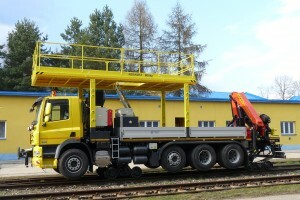 Road-Rail vehicle DAF CF85 DUOLINER is designed for ride and work on road as well as for ride and work on state, regional, and plant railway tracks. 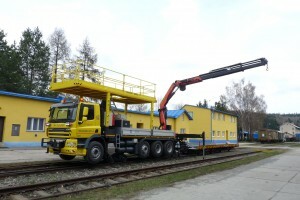 The vehicle is equipped with fixed platform, with loading capacity of 800 kg, used for installing of required equipment at heights as well as with hydraulic loading crane of 22tm capacity, which is located at the rear part of the vehicle and is designed to handle the load, or to work with a basket. The vehicle is designed for ride on rails of railway gauge of 1435 or 1520 mm (adjustable railway gauge). 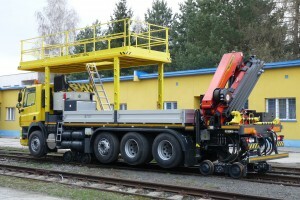 Both rail gears are four-wheeled and are located behind the road axles. Vehicle is equipped with hydrostatic drive and can use also microdrive regime. The rear rotational rail boogie enables easier on-tracking. Optionally, drive can be controlled by remote control. The movement of mechanisms is hydraulic and is controlled electrically from the side control panels located on the vehicle or from the driver´s cab. For the reverse drive, the vehicle is equipped with CCTV cam system and with colour LCD display in the driver´s cab. Rail gears as well as the working platform are illuminated for work at night.